There are billion of Facebook users including me who are eager to know more about the secrete tips and tricks of Facebook. During surfing on the Facebook we have to click on different options to open them. 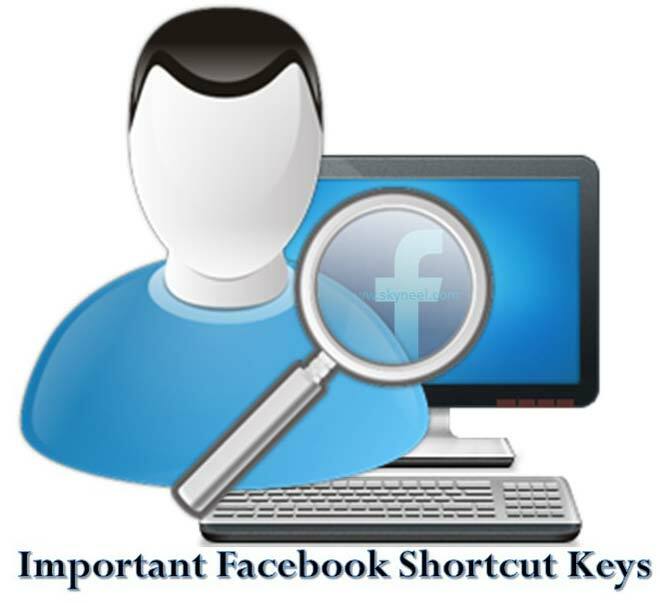 In this article we discuss about the few important Facebook shortcut keys which help us to quickly do any job. Facebook is free to use social networking website which allows his registered users to quickly send text, video, images to each others. It is available in 37 different languages around the world which provide different interesting features. We have already discuss few important Facebook chatting shortcut keys in our previous article. You can easily create one or more groups and allow members to share different topics to each other. You can create your own page and allow different members to promote your page with different interesting topics. Most of the person run his Facebook account on different web browser. In this article we have to discuss few important Facebook shortcut keys which runs on different web browser. Must Read: How to check who views my Facebook profile? There are lot of person’s who have registered account on the Facebook . They have to operate his Facebook account either from computer or Android phone. Sometime we need to fast work on Facebook in that situation you have to know given important Facebook shortcut keys. You have to use given Facebook shortcut keys for Google Chrome web browser. Alt+ 7 – To quickly open Activity Log of Facebook. Alt+ 8 – To quickly open Fan-page of Facebook. Alt+ 9 – To quickly open Terms & conditions page of Facebook. You have to use given Facebook shortcut keys for Mozila Firefox web browser. Shift+ Alt+ 7 – To quickly open Activity Log of Facebook. Shift+ Alt+ 8 – To quickly open Fan-page of Facebook. Shift+ Alt+ 9 – To quickly open Terms & conditions page of Facebook. You have to use given Facebook shortcut keys for Internet Explorer web browser. Alt+ M+ Enter – To quickly open send a new message box of Facebook. Alt+ 0+ Enter – To quickly open the Help centre page of Facebook. Alt+ 1+ Enter – To quickly open Home page of Facebook. Alt+ 2+ Enter – To quickly open the Timeline or profile page of Facebook. Alt+ 3+ Enter – To quickly open the Friends list to accept or deny friend request of Facebook. Alt+ 4+ Enter – To quickly open the Inbox or Message page of Facebook. Alt+ 5+ Enter – To quickly open all Notifications of Facebook. Alt+ 6+ Enter – To quickly open Settings or account settings page of Facebook. Alt+ 7+ Enter – To quickly open Activity Log of Facebook. Alt+ 8+ Enter – To quickly open Fan-page of Facebook. Alt+ 9+ Enter – To quickly open Terms & conditions page of Facebook. I hope after reading this article you can easily understand about the important Facebook shortcut keys. You must have to use all these given shortcut keys which helps you to fast navigate in your Facebook account. If you have any suggestion regarding this article please write us in the comment box. Thanks to all.